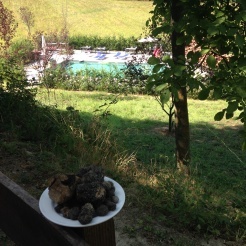 The House is in the private park of vineyards, Hazel and truffle grounds in the heart of the Langa of Asti. Offers an outdoor swimming pool, solarium, barbecue, 800 sqm spaces inside and outside the home. The living room excludes breakfast and dinner buffet. Includes internet access, tv in all rooms, with private bathroom, toiletries, hairdryer, fully equipped kitchenette. Ideal for conventions and sown. For rent villa in exclusive use up to 34 people.